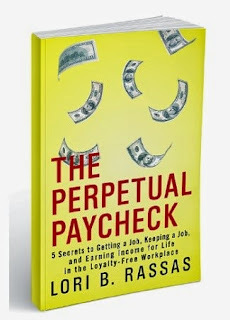 Today we are interviewing Lori B. Rassas, author of the career/business book The Perpetual Paycheck: 5 Secrets to Getting a Job, Keeping a Job, and Earning Income for Life in the Loyalty-free Workplace. I am an employment attorney and coach with the unique experience of having been on both sides of the negotiating table in employment matters, having offered pragmatic advice to both employees and employers. This two-sided background enables me to offer advice that will give individuals an extraordinary edge in the job-search process. I am also an author, professor, trainer, and mediator. Perhaps more important than my professional expertise, however, is that I am not just writing about the loyalty-free workplace and the benefits it has to offer—but I work within it. I’ve experienced the highest workplace highs you can imagine, and some of the lowest lows. I’ve applied for jobs, and I’ve been rejected from jobs, via mail, phone, email, postcard, and text. In many, many, many cases, I have been completely ignored. I’ve moved through the interview process with prominent employers that, objectively speaking, should never have considered my application. And I’ve been rejected for positions that were a perfect fit. Because of this, I have a very good, real-world grasp of the various issues that job seekers in today’s workplace, and I’ve learned how to navigate it successfully. The book is drawn from secrets I’ve learned from my experiences. One such secret, which I share with my clients (and now with my readers), is that, when looking for a job in today’s workplace, you have to remember that it’s not about you—it’s about your employer. I took my own advice and applied it to The Perpetual Paycheck. The book is not about me, but rather about providing readers with the information they demand. 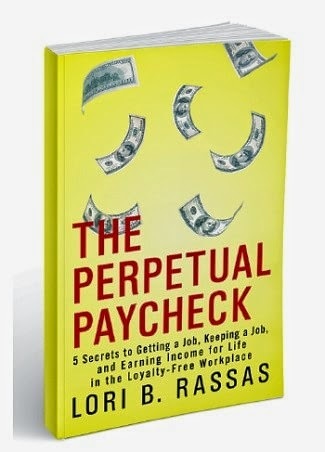 The Perpetual Paycheck: 5 Secrets to Getting a Job, Keeping a Job, and Earning Income for Life in the Loyalty-free Workplace is an accessible nuts-and-bolts guide for those looking for a new job, those looking to solidify their current position, those looking to move up, and those looking to change careers or industries. The book introduces job seekers to the loyalty-free workplace that exists today, and provides instructions to not just survive a workplace that is commitment-free, but thrive in it. It may not seem like it, but these are golden years for employees, because the loyalty-free workplace is bursting at the seams with rewards that are waiting to be claimed. You just have to know how to navigate the process. You write about today’s workplace being loyalty-free. Can you elaborate on this a bit and explain why it’s important for potential employees to be aware of this? Absolutely. The concept of the loyalty-free workplace is the overriding theme for this book because this reality should inform every employment decision individuals make. The fact is, an employment relationship is a business relationship, and so employees need to start to view it in that way. In the past, we had more leeway in this regard because our jobs tended to be fairly secure, and annual raises and promotional advancement were the norm. Today, for a number of reasons, things have changed. In order to thrive in this environment, we need to adapt. You say that now is the perfect time to be looking for a job. Why is this? The workplace environment has changed from a place where co-workers were viewed as second families, and employers and employees entered into lifelong, mutually beneficial relationships, to one with an expectation that everyone needs to look out for him or herself. While this may seem counterintuitive, this is actually a good thing because it lets employees know exactly where they stand—i.e, they are in constant danger of losing the income they need in order to survive. This makes an employee’s decision to seek career opportunities that offer more compensation the only rational and, more importantly, the expected response. This new environment offers incredibly opportunities for individuals to find a better job and to have no unwanted gaps in your stream of income—in other words, to have a perpetual paycheck. The key is acknowledging and accepting the workplace as it is, and then using every component of it to your advantage. The Perpetual Paycheck provides a contrarian approach to the workplace, so that anyone who has a job, or is looking for a job, will benefit from learning about the environment. One of the reasons I decided to write this book was because I often found that I was providing similar advice to people who were in all phases of their careers—from college graduates, to people who were recently laid off, to career changers looking for their next chapters to begin. The workplace is loyalty-free, so you need to understand what that means, and adapt your approach to respond to it. You have a lot of experience in employment, having been an employment attorney, coach, and professor with close to two decades of experience. What first got you interested in helping others with their employment goals? Working in the employment field always seems to be a natural transition for me. My parents ran a family-owned and operated business, which was started in 1930 by my grandfather and his brothers. My dad started to work there in 1964, and just recently retired. My grandfather also worked there until he passed away in 2004, just a few days before his 95th birthday. Most of the employees worked there for two decades or more. Because of this, dinner conversations between my parents, my three sisters and me often included robust discussions about employment matters. Looking back, I can definitely see this cultural shift from those dinner conversations as a young child, where employees planned to work for a single employer for their entire careers (based on a sense of mutual loyalty and respect), to the workplace we have today, where the relationship lasts only until either party to the working relationship finds a better option. I’ve had countless conversations with my dad about the fact that things have changed and that he would not have been able to run the successful business he did, had he started in today’s workplace (as opposed to the workplace that existing decades ago). What was the most interesting thing you uncovered while doing research for The Perpetual Paycheck? Just how prevalent the loyalty-free workplace is! Throughout my career, and certainly through the process of writing this book, I talked about these workplace strategies with people in all different phases of their careers, and it was truly fascinating to hear about their shared experiences. The experience of an executive earning six figures was the same as that of a recent graduate who was not yet earning enough to move out of their family home, or a middle-manager looking to work in a new industry. To thrive in today’s workplace, employees and job-seekers need to understand and accept the realities of the loyalty-free environment. The Perpetual Paycheck provides guidance to do just that. I think initially this may seem like a real eye-opener for most people. But, as people work their way through it, I am confident they will find themselves nodding their heads in agreement and quickly recognizing that many of the scenarios I discuss in the book are the exact kind of situations that they are facing today. It is prevalent, we are working in it. But once you identify what’s happening, you can take advantage of the many opportunities to earn a steady paycheck today, even in a loyalty-free workplace. The book shows readers how. What do you think will be the biggest misconception about The Perpetual Paycheck? One is, since I talk a lot about the importance of putting yourself in a position so that you always take advantage of opportunities that enable you to earn as much money as possible throughout your working life, some believe that I am suggesting that everyone should abandon their passions, work for money (and for money only), and look out for no one but themselves. Nothing could be further from the truth. I consider myself to be an incredibly loyal employee, and I am confident my prior employers would agree with that characterization. I am also incredibly passionate about my work. However, I achieved the most success in securing and maintaining employment only after I embraced the realities of the loyalty-free workplace and adapted my approach to securing and maintaining jobs to those realities. The fact is that there is nothing inherently inconsistent with being a loyal employee and working in a loyalty-free workplace. I loved my prior jobs, but when it became clear that there were no more opportunities for advancements (in terms of learning new skills and more compensation), I had to make the decision to leave so that I could continue to advance. That wasn’t always an easy decision to make. But, if you think in terms of one’s career path (which is to grow and more forward whenever possible), it did not make sense for me to remain in place—and, in all fairness, it did not make sense for my employers to promote me, just for the sake of promoting me. I think most people today would agree with that. Going back to the idea of passion, the book in no way discourages readers from pursuing their passions. In fact, I encourage the opposite. By seeking out opportunities for advancement and/or additional compensation, you will always put yourself in the position to fund your passions (be that traveling, sailing, collecting art, or whatever they happen to be) and develop them to your heart’s content. I’m glad you asked because I certainly have much more to say about the loyalty-free workplace and all of the benefits it has to offer. Since the secrets presented in this book focus on both how to excel at your current job and how to find your next one, I am already working on another book about how to negotiate the terms of employment once you do get the offer. I am finding many similarities between how individual approach the job search process (using the same processes that worked in the past) and how individuals negotiate their salaries. One of the keys to interviewing for a job in the loyalty-free workplace is understanding that, with regard to the position that needs to be filled, it’s not about your needs, but the needs of the company. That approach also comes in handy once it’s time to negotiate the terms of employment. 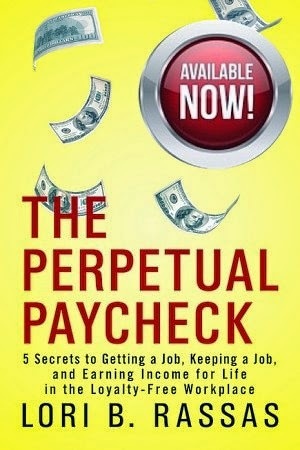 Is there anything else you'd like potential readers to know about The Perpetual Paycheck? Just that I know that the job search process may seem daunting, and people may be discouraged—but it really doesn’t have to be that way. We have been taught that the most successful formula for finding a job is to set up informational interviews. That approach may have worked before, but it no longer works in today’s workplace. Yet not many people realize that. Instead, most people are still applying the same obsolete formula to their job search, without getting any results. Today’s workplace is loyalty-free. Job seekers must adjust that their strategies to fit that reality in order to achieve success. It really is a great day to look for a new job. If you use the strategies I discuss in The Perpetual Paycheck, you’ll see exactly what I mean.